For four times in the past two years, I have taught a term-long Church Planting module at two colleges in England. The students taking this module have been exclusively African—from many countries, denominations, networks, and movements across the continent. The question that shapes the module—and the conversations thereof—has always been “how can African Christians plant culturally relevant churches in Europe?” I am pleasantly surprised to hear that African pastors in Europe are asking this question. I believe that this is the right question for them to be asking—it is the question that will lead them to a place where it is possible to talk about God’s mission in Europe. Overall, the state of African church planting in Europe is both exciting and alarming—probably more alarming than exciting. It is exciting because African churches in Europe have continued to mushroom for the third decade straight by their thousands. African Christian presence is growing in Europe. For instance, the Redeemed Christian Church of God has around 700 congregations in Britain. The Church of Pentecost has 130 congregations in Britain. Both these denominations planted their first churches in Britain in the 80’s. There are many other smaller networks and denominations that are also multiplying their churches. Generally, the figures look impressive on paper. Of course, the average African congregation in Europe will be fairly small—with 20 members. And there is a handful of them with a few thousand members. Very few will grow beyond 150 members. Sour because over ninety percent of those churches are not contextually relevant in their locations. And that is because we are planting African churches for Africans in Europe—nothing more. We can boast thousands of churches in Europe, but if we are not connecting with the continent in mission, our churches have a gloomy future, (immigrant churches generally do not last more than two generations). And the nationalism that informs our ecclesiology means that Nigerian pastors are planting churches for Nigerians in Europe. Ghanaian churches are planting new congregations for Ghanaians, Congolese pastors are planting for the Congolese people, etc. Of course, whatever “evangelism” we do is tailored to seek out Africans (from our countries of origin) so we can invite them to our (nation-specific) churches. People say, “but we give tracts to everyone!” I agree, but if you think twice about it, you will notice that we do that while looking out for “our people.” Even when we discern where to plant churches, usually the first question is “are there any Malawians in that city?” if it is a Malawian pastor preparing to plant a church. If there are no Malawians, God will not call you to that city. We are planting chaplaincy churches. I have come to appreciate to an extent the existence of such churches. I suspect that the religious life of African Christians often needs a worldview (or even a theology) that is foreign to many Westerners and can thus be nurtured best among other Africans. But then, once we get to that conclusion, we will struggle to engage in mission among Westerners. And worse, we will not be able to share the faith with our children who are growing up with a western worldview. On the other hand, there is a serious lack of tools and resources needed to help Africans deal with the challenges of planting multicultural churches in Britain. My required reading list has one or two African books (and none of them focus on the issue of African church planting in the diaspora). Going through 20 MA theses on African church planting and church growth in Europe yielded no better results. Their bibliographies generally comprised of resources suggesting various permutations of the homogenous unit principle which, in effect, encourages whatever is already happening. But unfortunately for them, building homogenous churches limits them to a flooded, saturated, and fast shrinking market. Two surprising finds for me in teaching this module for four times in two years. First, most African churches are planted at the instruction of a denominational leadership based in Africa. For most of these, having branches in Europe is a badge of honour. For some, it is a means to access the Pound and the Euro to better finance their budgets in Africa. This means that there is little interest in actually planting churches that can evangelize Europe. [Many will only seek to find the quickest and easiest way to the money, and that generally is finding homogenous groups of their members from Africa living in Europe]. Second, there is a great need (and some desire) for a theological and missiological paradigm shift. 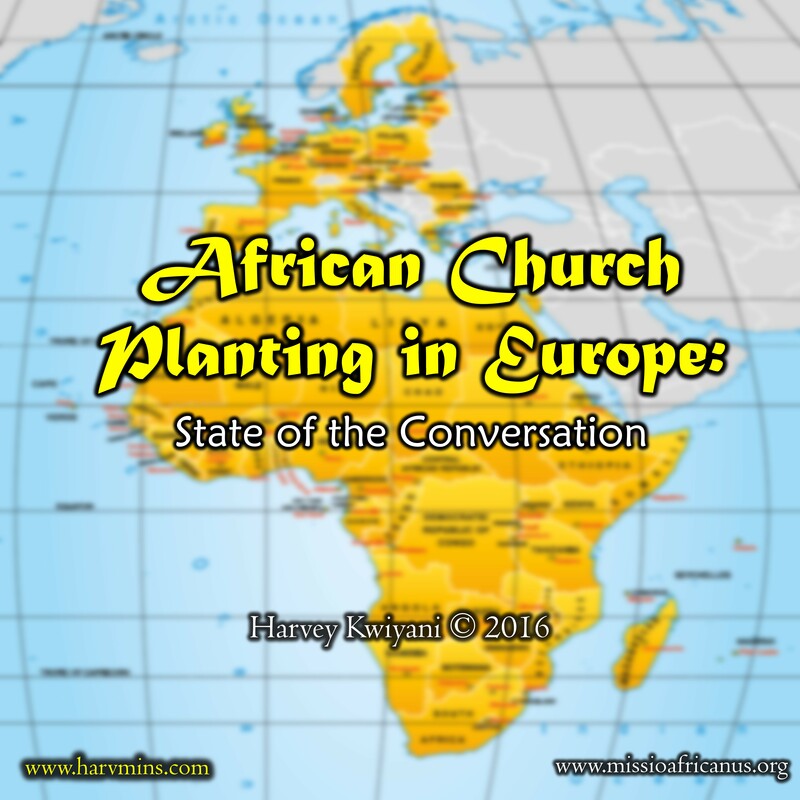 Africans cannot—and should not—continue to plant churches in Europe as if they are planting in Africa. This will need them to start thinking theologically and missiologically about what it is they are doing in Europe. Really perceptive Harvey. I hope I may quote this, please, with due attribution? Thanks, Steve. You may cite the blog. It exists to be a resource for the conversation. isnt it strategic (Biblical)and to start with your own people in the diaspora to form a strong foundation to reach the natives? Actually, Ted, I would argue that starting with your own people to form a strong foundation is neither strategic nor biblical.